Gastroenterology & Liver Disease Medical Office T.I. Dr. Zadeh is another very successful, fast track, project by Orr Builders, delivered on time and under budget. Orr Builders was again teamed with JFK and Holt Architects which by all measures is a proven winning team. Dr. Zadeh is Orr's most recently completed medical T.I. located on the 2nd floor in the beautiful 45,000 square foot La Quinta medical plaza, where Orr has constructed several other medical TI's. 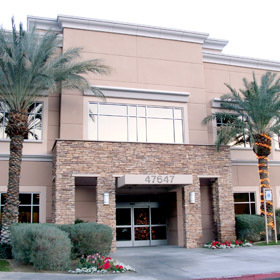 This 1,500 square foot medical office is Dr. Zadeh's third location in the valley. Dr. Zadeh's specializes in Gastroenterology issues and liver disease. The build-out, complete from permit to Certificate of Occupancy, was constructed in a little under 8 weeks, going from an empty shell to a finished office. The build-out was accomplished with a 'zero punch list' at our final acceptance walk through. The Superintendent from Orr Builders did a great job supervising the day-to-day construction while having to coordinate with and accommodate several existing tenants, our client, the building owner, the building property manager and their construction manager.